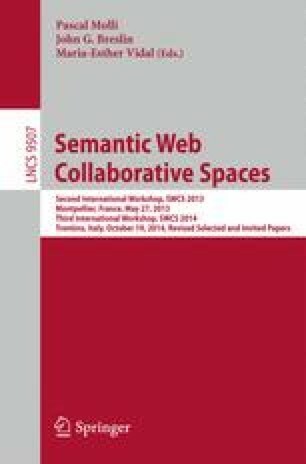 In the past 10-15 years, a large amount of resources have been devoted to develop highly sophisticated and effective tools for automated and semi-automated schema-vocabulary-ontology matching and alignment. However, very little effort has been made to consolidate the outputs, in particular to share the resulting mappings with the community of researchers and practitioners, support a community-driven revision/evaluation of mappings and make them reusable. Yet, mappings are an extremely valuable asset, as they provide an integration map for the web of data and the “glue” for the Global Giant Graph envisaged by Tim Berners-Lee. Aiming at kicking-off a positive endeavor, we have developed Synapsis, a platform to support a community-driven lifecycle of contextual mappings across ontologies, vocabularies and schemas. Okkam Synapsis offers utilities to load, create, maintain, annotate, subscribe, and define levels of agreement over user-defined contextual mappings. Furthermore, in order to ease the development of Semantic (Web) applications, Synapsis supports the creation of sets of mappings associated with an application placeholder. On the one hand, this allows developers to easily create and manipulate all the mappings required for their own application without affecting other users. On the other hand, a measure of Sharedness for the mappings defined across application contexts is proposed to enable the implementation of ranking metrics that can be used to order the mappings managed through Synapsis. Aiming at supporting a growing number of users, Synapsis was positively tested to be scalable in the order of millions of mappings, performing experiments with synthetic data. Applying the Data-as-a-Service (DaaS) paradigm, the sets of mappings created and managed by Synapsis are also available through REST services, to further facilitate integration into applications working with heterogeneous data. This work is partially supported by TAG CLOUD (Technologies lead to Adaptability and lifelong enGagement with culture throughout the CLOUD) FP7 EU Funded project, Grant agreement nr: 600924. This work has been partially funded by the Autonomous Province of Trento through SICRaS project (Legge 6/1999, DD n. 251).